While eSports grew consistently from 2010 to 2013, the market really took off in 2014. 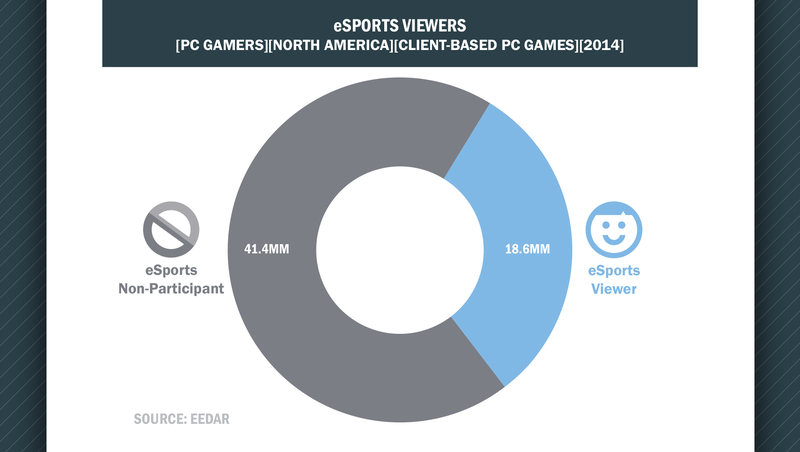 Driven by the rapid growth of streaming video and rising prize purses from increased sponsorship and crowdfunding, eSports grew significantly year-over-year in participants, viewers, revenue, and tournaments. The number of eSports tournaments worldwide more than tripled from 430 in 2013 to 1,485 in 2014. These 1,485 tournaments were viewed by more than 100 million viewers worldwide. eSports is especially attractive to sponsors because it provides a way to target an especially valuable consumer, the engaged PC gamer who spends more on hardware and software than the average gamer. This is similar to the highly attractive audience who watches golf on television, as sports networks are able to command a premium for advertising because golf viewers are a high spend audience. The following graph shows the average amount of money PC gamers spent on their current gaming system and peripherals. Gifts and factory-included peripherals are counted as $0, which contributes to the low average peripheral spend for eSports non-participants. eSports viewers spend more than twice as much on peripherals and 30 percent more on their system as PC gamers that do not participate in eSports. 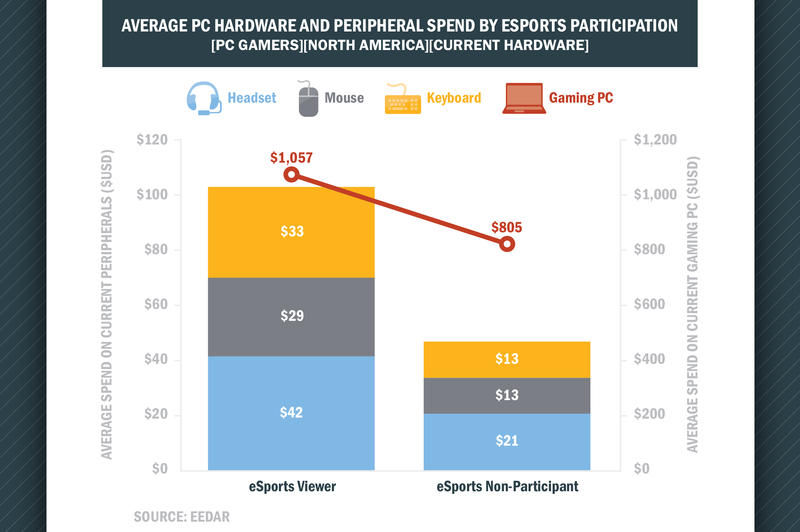 On average, eSports viewers spent more than $100 on their current peripherals. It makes sense that eSports players will spend a premium on peripherals to maximize competitive performance. The data suggests that eSports viewers are also willing to spend to maximize their gaming performance. 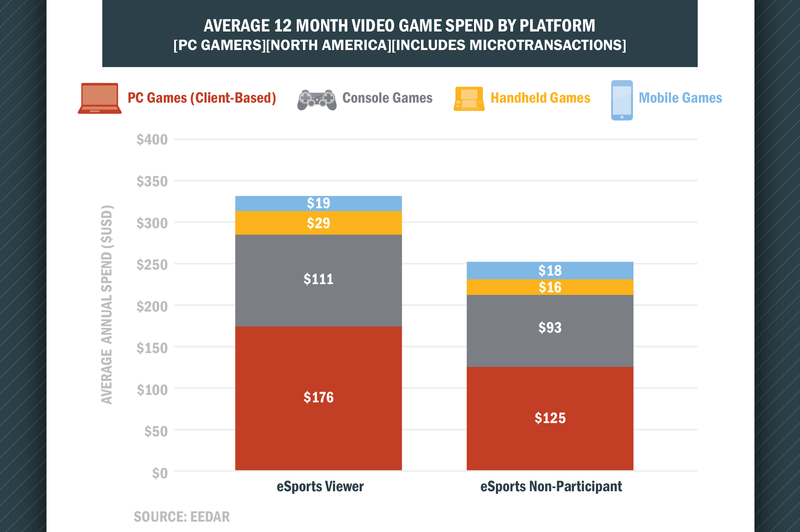 The higher average spend of eSports viewers is critical because the market size of eSports viewers has grown to become a significant percentage of the PC gaming population. eSports viewers do not just spend more money than non-participants on their hardware and peripherals. eSports viewers are more engaged gamers across different gaming experiences, spending more on video games across platforms and genres. The following table shows the annual video game spend across console and PC for PC gamers, segmented by eSports participation. The major players in the eSports supply chain, including the publishers of competitive multiplayer games (e.g. Riot, Valve), eSports leagues (e.g. ESL), and content distribution channels (e.g. Twitch) have done an excellent job of creating a viewing experience that makes viewers feel like they are also involved in the tournament. Team-based tournament betting, in-game items that show team support, merchandise, and microtransactions that increase tournament prize pools have all helped to drive this engagement. This has helped create an audience that spends almost as much on the competitive gaming hardware as the tournament players themselves - and is a goldmine for tournament sponsors.